It seems like a new hot marketing tactic is popping up every day (do you need to be on Snapchat? Should you invest in video marketing?). So it’s easy to overlook email marketing – the old standby that businesses have used for decades to reach potential customers. So how do you harness the power of email? Email marketing software for small business has come a long way from the “batch & blast” email systems of the past. Today, email marketing software with integrated marketing automation technology helps small businesses to dynamically respond to the individual needs of their prospects and customers. 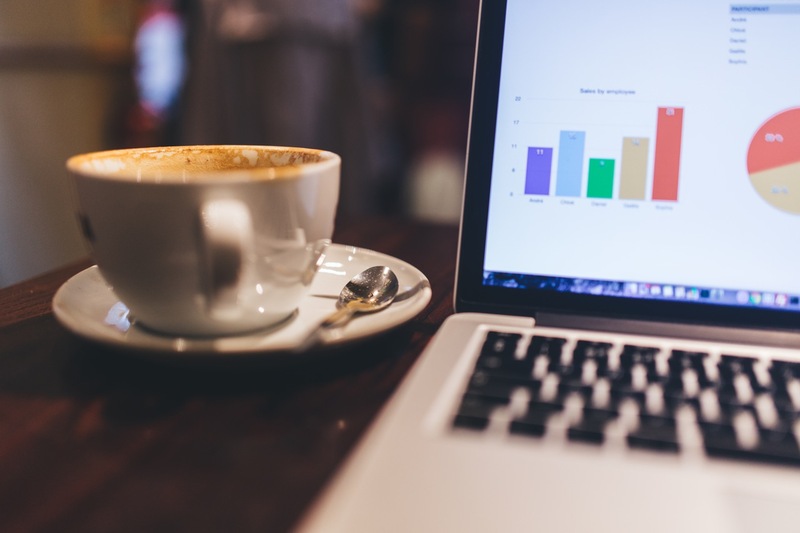 Stand alone email marketing software tracks basic metrics like clicks and opens. While click-through and open rate indicate how effective your emails are, they don’t do much in the way of guiding your contacts to the next step in their customer journey. Marketing automation software is a tool that lets you do more with your email marketing data. Marketing automation tracks which email links your contacts click on, which pages they visit on your website, and even which forms they fill out. This data paints a picture of what your contacts are most interested in, allowing you to focus your marketing campaigns accordingly. One of the reasons that many people overlook email sent from different businesses is that it feels generic. That is, the company is trying to cast such a wide net and reach as wide an audience as possible, but it leaves those who receive it feeling like the business sees them as anonymous walking wallets. However, email marketing software for small business allows you to add contextualization to every aspect of the email marketing experience. In a stand alone email marketing software, you might have lists like “Customers” and “Prospects” that you manually import from your email client, spreadsheet or database. When you use marketing automation, however, you can create dynamic lists. You can pull an up-to-date list based on your contacts’ interests, their demographics, or their contact status. By creating distinct groups of customers, you can send targeted emails to the groups likeliest to respond to these particular messages and offers. You can also set up triggered email that helps to follow up on earlier interest a customer may show. You can create entire nurturing email campaigns to organically move customers through the sales funnel while letting you monitor where they are at each step of the way. By sending relevant resources and solutions to those who need them, you show your contacts that you understand their needs, building trust – and eventually sales. When it comes to email marketing, naturally, the focus is building marketing emails and campaigns that drive conversions. However, transactional emails are opened far more than marketing emails. Think about it. When you send a marketing email, you’re pushing a message out to your audience – whether they’re ready for it or not. When it comes to transactional emails, however, you’re sending an email in response to an action from your contact (like paying for a service, or requesting more information from your website). Transactional emails therefore have higher engagement, giving them the potential to generate far greater revenue than marketing-focused emails. Transactional emails are the perfect opportunity to make a lasting impression on your prospects and customers. Personalize where it makes sense. Make sure they are in-line with current company branding. Opt for friendly language. 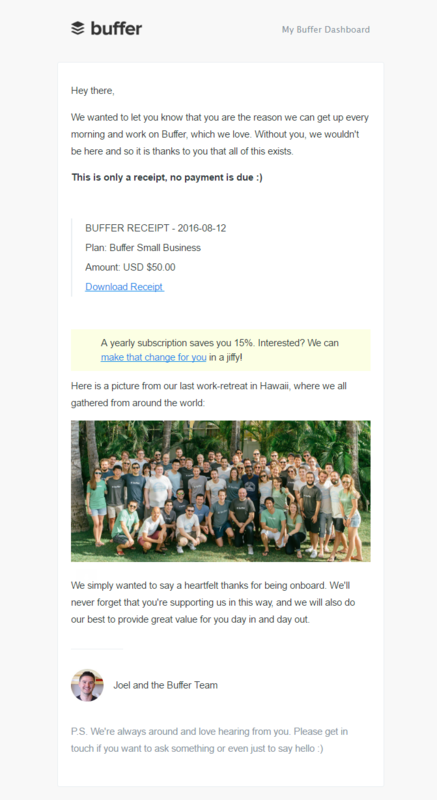 Not only is the Buffer email super personal, but the “P.S.” also provides a touch point with the customer – an opportunity to be heard. Marketing automation can help you offer a next step in your transactional emails to make prospects and customers feel more invested in your business so you can capture additional revenue. For instance, if a prospect fills out a form to receive an e-book from your website, send a thank you email with a link to the e-book they requested, but also take the opportunity to help them to learn more about your services. Ask them to check out a related video, for example, guiding them further down the path to conversion. Marketing automation software can monitor engagement with transactional emails. As with marketing emails, you have an opportunity to see what works and what does not and to make even this once-perfunctory part of your company communication more in line with customer expectations. Marketing automation is a powerful way to utilize email marketing to its fullest so you can squeeze every opportunity from your list of prospects and customers. With marketing automation, you send more personalized messages, building trust and nurturing relationships into more sales for your business. CRM + Email Marketing = Great!